BERRYVILLE, Va. -- During a tour of small businesses on this town's quaint West Main Street, Susan Allen introduces herself to a female passerby and encourages the woman to support her husband George's U.S. Senate bid. After chatting, the woman notices Allen's opal ring and asks if it is her birthstone. No, she answers with a smile; it was simply a gift from her husband. "It's just George being sweet." 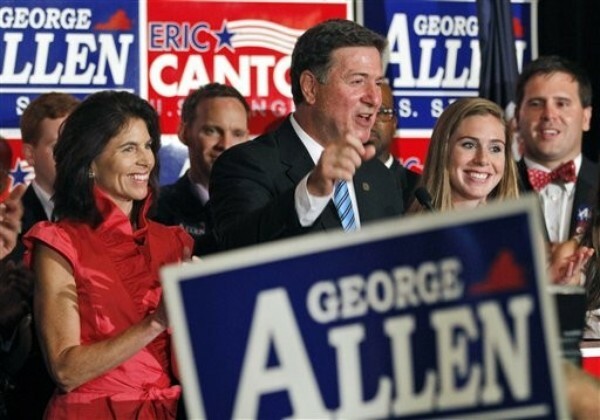 Sweet is not an adjective typically associated with George Allen, who once encouraged Republicans to knock Virginia Democrats’ “soft teeth down their whiny throats,” and whose use of the epithet “macaca” to describe a Democratic tracker of Indian descent may have cost him his 2006 Senate re-election bid. A recent Quinnipiac University poll finds Allen trailing among women by three points, and among independent voters by two points, to his Democratic opponent, Tim Kaine. Both candidates in this race have extraordinary name recognition, as they each served a term as governor, so the contest could come down to these key voting blocs. It’s clear the Allen campaign recognizes the importance of this deficit: It has released three television ads this cycle featuring women -- who know or have worked with the candidate -- praising his personal attributes. But the ads began airing only recently. Susan Allen has been criss-crossing the state for the better part of the year on a schedule that resembles that of a candidate, often reminding voters about the George Allen of 1993, when he successfully ran for governor. After the two-hour small-business tour here on a recent weekday, for example, she addresses Republican supporters at an outdoor luncheon, then mingles with sundress-clad women at an afternoon tea in the sprawling home of a GOP activist in the Shenandoah Valley. Later, she gives a speech on behalf of her husband at the Virginia Poultry Growers Association annual meeting, where Rep. Bob Goodlatte delivers the keynote and farmers munch on barbeque chicken sandwiches and mashed potatoes. Seeming as energized and animated at this last event of the day as she was at the first, Allen gives hugs, tells family stories, and greets strangers -- one of whom admits she hasn’t heard of George Allen. In the following couple of days, she opens a Romney campaign office with former New York City Mayor Rudy Giuliani and Virginia Lt. Gov. Bill Bolling, and attends another luncheon before visiting a tomato festival. “George isn’t a shopper, but he loves to buy rugs,” she tells Yousaf Sheikh, who owns an oriental carpet store in Berryville. Sheikh tells her that business is slow. “Walk on Main Street and see how many signs you’ll see for rent or for sale,” he says, referring to vacant storefronts. Allen tells him her husband is pushing economic development and support for small businesses. Yousaf tells RCP that though he appreciated her visit, “she didn’t say much about platform.” He considers himself an independent voter, and says he doesn’t know for whom he will vote in November. Of course, Allen isn’t the only former first lady of Virginia campaigning in this Senate race. Kaine’s wife, Anne Holton, is stumping for her husband for the first time --her career as a juvenile court judge prohibited such involvement in politics, but she gave up the judicial robes when Kaine became governor in 2006. As the daughter of a Republican governor of the Old Dominion -- her father is Linwood Holton -- she knows the state well.